Jack Ivers serves for Miami Trace during a Frontier Athletic Conference third singles match against the Washington Blue Lions Tuesday, April 9, 2019 at Miami Trace High School. 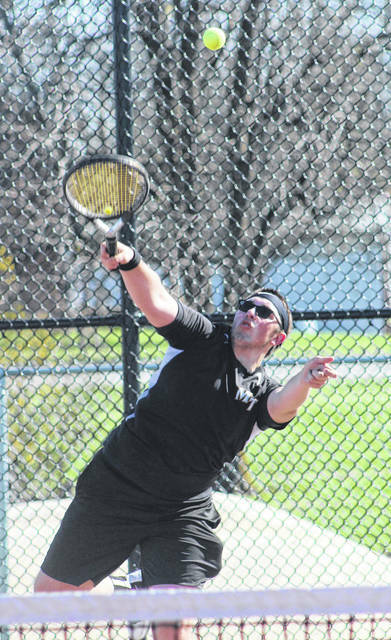 Ty Rose makes the return for Washington during a first doubles match at Miami Trace High School Tuesday, April 9, 2019. 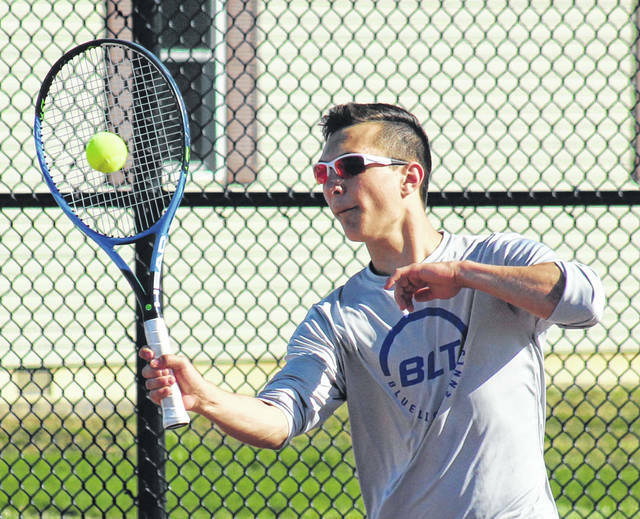 On a sunny, mild and very breezy Tuesday, April 9, the Washington Blue Lion tennis team visited Miami Trace High School to take on the Panthers in a Frontier Athletic Conference match. Miami Trace won the match, four courts to one. At first singles, Grant Kuhlwein defeated Isaac Abare, 6-2, 6-4. At second singles, Devin Riggs beat Blaise Tayese, 6-2, 6-4. Jack Ivers won the third singles match against Ryan Elrich, 6-1, 6-4. Rylan Gardner and Caleb Perry defeated Ty Rose and Josh Cartwright at first doubles, 6-0, 6-0. At second doubles, Kody Burns and Jake Harris beat Sam Schroeder and Olivia Wayne, 6-2, 6-0. The two teams split a pair of j-v matches. Washington’s Rachel Palmer and Shrey Maniya defeated Brayden Jackson and Sebastian Gurruchaga in a pro-set, 8-6. In a one-set singles match, Miami Trace’s Lukas Carter beat Chandler Carr, 6-4. Washington is at Circleville Wednesday and Miami Trace is at Unioto Thursday. Starting time for both is 4:30 p.m.